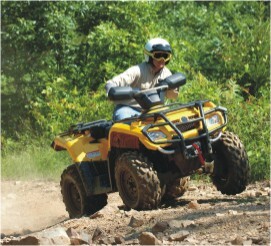 We want to hold an ATV Club Hunt using our four wheelers on our club trails. We are all adults and there are usually 35-50 members who participate in our other functions. I'm not sure of the best way to set it up? Do we find hidden items or do we make up clues? I don't know what you have available to you, but it would be fun to map out a number of gps or compass positions and hide items within a 3 foot radius of those settings (or whatever you choose). Each team would need a gps device or compass in order to play. They would also need a list of the positions and a hint as to what to look for at those positions (eg. a knife - look for something sharp at such and such coordinates). The items being searched for could tie into one theme and include a final challenge. If the theme were fishing you might hide a rod at one location, a reel at another, fishing line at another, lure, booble, bait, etc., with the last clue indicating teams have to put the fishing gear together and be the first team to catch a fish at whatever lake or pond to be declared the winner. You might want to give the winning team a free meal at Joe's Chicken and Grill. If that's the case hide items that would give clues to what restaurant they would be going to and then, the first team to collect the items, decipher the clues, and find their way to the right restaurant would get dinner free. The other teams would have to pay. You could also give each team a set of coordinates which would lead to the location of the next set of coordinates, etc. till they arrived at the final destination. If you don't have compasses or gps systems and want to do a clue hunt on the trails, you would need some defined locations or it would be impossible for teams to find anything (eg. a bridge, a large rock, a pond, a fallen down tree). You could also hide some larger items or camouflaged people along the trail, but that might be more like hide and go seek. If you need help with a specific clue please post in the comment box below. MY FRIENDS STARTED ATV SCAVENGER HUNTS.. FOR THE 4TH OF JULY.. WE'LL HAVE TO FIND FLAGS IN THE WOODS AND THEY'LL BE NUMBERED.. TAKE THEM BACK TO A BOARD TO FIND OUT WHAT TO DO.. THEY ALSO HIDE FLASHING LIGHTS/ GLOW STICKS/ EASTER EGGS WITH "THINGS TO DO" IN THEM.. WE'VE EVEN HIDDEN A BIRTHDAY CAKE!